Pope Francis stressed this today, March 21, 2019, when addressing in the Vatican members of the Italian Federation of Pediatricians, as he quoted their “illustrious colleague and teacher,” Dr. Franco Panizon, when he had described the unconditional dedication necessary to their important work. 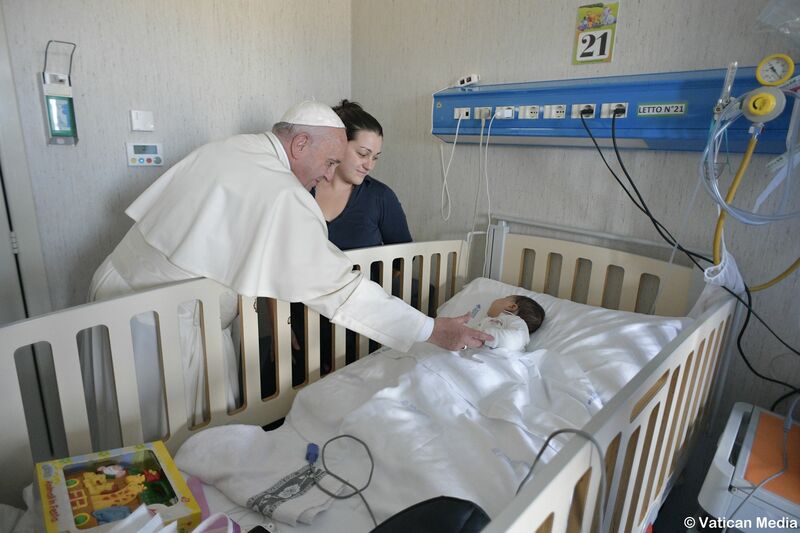 The Holy Father reminded them to hold Jesus as role model. “By virtue of the faith you have received, you are always called to regard Jesus, source of closeness and tenderness, as a model of humanity and dedication to others. By reading and re-reading the Gospel texts in which Jesus meets and heals the sick often, you always draw new lymph for your being and your action,” he said. The Pope concluded, thanking the pediatricians, blessing them and their work and reminding them to pray for him. Later in the day, Pope Francis traveled to the Vatican headquarters of the Scholas Occurrentes papal foundation, founded by Pope Francis in 2013, to promote educational initiatives around the world, where he launched the “Programming for Peace” Initiative. ZENIT will bring you the Pope’s remarks and responses in English as soon as possible. I warmly welcome you and greet you all. I thank the President for the words he addressed to me. With the experience gained in these forty years of activity, your Federation supports and protects more than 5,500 family pediatricians, offering them competence and support from a professional and moral point of view, in the sphere of welfare and social security, as well as in the legal and economic fields. What you provide is a wide-ranging assistance, necessary to follow your affiliates in all the steps of their professional life, and useful to ensure that they can carry out their delicate and essential task with more serenity, as well as with greater competence. Already in its first steps, the Federation distinguished itself for the contribution it gave to the birth of the National Health Service, and over the years has implemented countless initiatives for the health of people and the improvement of services offered to citizens, stipulating public and private agreements, maintaining in an autonomous and non-partisan way an active exchange with the political and social parts, and ensuring a control over many essential aspects of the health of the child and adolescent. The age you are dealing with, from birth to adolescence, is undoubtedly the most evolutionary of human life, and requires global knowledge about the human body and its pathologies. It can be about understanding and managing heart and circulatory problems in a newborn child, or the digestive system in a ten-year-old child, or physical and mental issues related to puberty, and so on. This very wide range of skills requires both in-depth basic training and constant updating. This is the aim of the many training and research initiatives that you strive to prepare, with meetings, debates and conferences providing you pediatricians with the elements you need to remain up to date and, at the same time, promote a culture more capable of protecting the health of people, especially little ones. In our time, where the many comforts and technological and social developments are paid for with an increasingly invasive impact on the natural dynamics of the human body, it becomes urgent to implement a serious program of health education and lifestyles that respects the body, so that progress does not come at the expense of the person. Your constant commitment in the areas of training, prevention and research has been recognized with the accreditation of your Federation as a scientific society. May you always operate with seriousness and dedication, making you promoters of a culture of solidarity and inclusive health. In our time, in fact, increasingly often prevention and treatment become the prerogative of those who enjoy a certain standard of living, and therefore can afford it. I encourage you to work to ensure that this inequality is not added to the many others that already afflict the weakest, but rather that the health system assure assistance and preventative care to all, as rights of the person. In fact, attention to the person, together with scientific competence, is an essential feature of your professionalism, of which the ability to listen, to understand and to inspire trust is also an integral part. By virtue of the faith you have received, you are always called to regard Jesus, source of closeness and tenderness, as a model of humanity and dedication to others. By reading and re-reading the Gospel texts in which Jesus meets and heals the sick often, you always draw new lymph for your being and your action. Even more than with children, your work puts you in constant contact with parents, the first custodians and managers of your patients. They not only ask for your medical expertise, but they also seek human security, entrusting you with what they hold most dear. As for the relationship with the children you examine, they have powerful antennas, and rapidly grasp whether we are well disposed to them or if we are distracted, because maybe we wish we had already finished the shift, would like to work faster, or find a patient who screams less … You too are men and women, with your worries, but we know that you are also trained to smile, necessary to give courage and open a gap of trust in the little ones; and even medicines are more effective. In dealing with children, we always keep in mind precisely the words of Jesus who, in a world in which they were little considered, indicates them as a model for those who become part of the Kingdom of God, because they understand its secrets. We also remember His singularly attractive attitude towards them: although He did not call them to Him with invitations or gifts, He recalled them with the strength and serenity that flowed from His person, so that the children went to Him and He welcomed them. Your illustrious colleague and teacher, Dr. Franco Panizon, spoke of this unconditional dedication. He said: “Never rest your head on the pillow, unless you have first done everything in your power for them!” He urged pediatricians to assume a role, small but very important, in writing the culture and therefore the history of our time. For this reason he invited you to look “beyond”, that is, beyond sickness and contingencies, beyond the present moment, beyond the self or one’s own effort. He also said: “Do not just think about your patient today, but also think about his tomorrow”; and again: “do not think only of your patients, but also think of all patients; do not think only of those present, but also think of those who are distant and future”. When experienced with this inspiration, the work you do represents a real mission, which involves both the mind and the heart, and somehow knows no detachment, because although there are periods of vacation and breaks from work, your profession will always accompany you, and involves you for far longer and more deeply than during the hours you are at work. With this style, you give Christian witness, because you seek to practice Gospel values and your sense of belonging to the Church; but also for the breadth of your gaze, for the ability to imagine the social context and the health system most appropriate for the future, and for your desire to be at the service, with humility and competence, of every person entrusted to you. In invoking God’s blessing on your path as an association, and on each one of you, I ask you in turn to pray for me. Thank you!